Lots of friends, family, and other people have inquired as to my wellbeing. 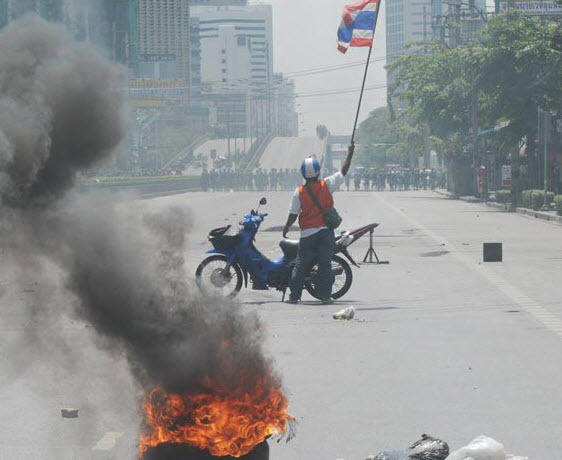 “We saw the news,” they say, “and it looks like a civil war has broken out in Bangkok.” While I appreciate the concern, I would like to add some perspective to what you are reading and seeing in the news in your respective countries. What Mr. Fuller hasn’t made clear is that this isn’t the typical scene in Bangkok. It is the scene he has faced by choosing professionally to put himself in dangerous places in order to capture the story. While I greatly respect his dedication to his work, I think it presents a very misleading impression of the city. Above: (my picture) Smoke from the Bon Kai neighborhood on Rama IV Road where protesters set a large number of tires on fire, accidentally sparking a blaze that consumed a nearby convenience store. The new Airport Express station is in the foreground and Asoke Road is on the left side of the picture. 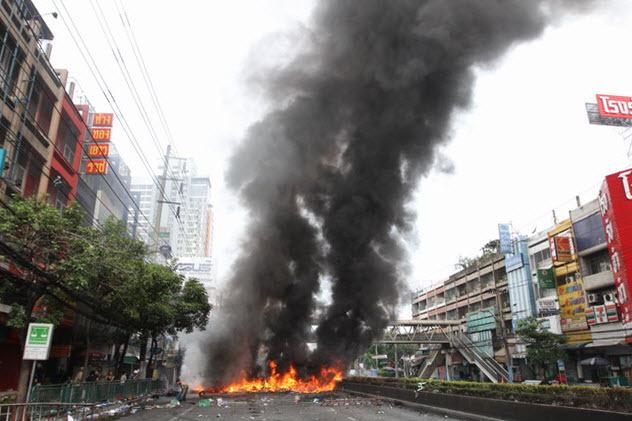 Below is an image (near as I can figure) of the same fire, taken by the Bangkok Post. First off (and I swear, I’ve written an entry like this before), Tawn and I are fine. We are at home, located in a safe section of the city a few miles away from where the military action is. Our neighborhood is pretty much business as usual, although not quite as busy as normal. The government has announced a curfew at 6pm tonight for certain sections of the city, although it is not clear that our area will be included. After forty days of occupying the Ratchaprasong shopping district and agreeing to, and then backing out of, a negotiated settlement with the government, the United Front for Democracy against Dictatorship (UDD / “Red Shirts”) have reached the end of the line. Amid increasing impatience from the residents of Bangkok, the government has set up a perimeter around the one-square mile protest area, blocking entry of people and supplies. Protesters and residents are allowed to exit but cannot enter. In the first three days of the military’s blockade, UDD’s numbers have reduced to an estimated 6,000. There have been a dozen or so skirmishes leaving about two dozen people dead. Several barricades of tires have been set aflame and dozens more people are injured. Above, an iconic image of a motorcycle taxi driver facing off against a line of army troops. The flyover in the background goes over Sathorn Road. Image from The Nation. At this time, the military has not moved to actively clear the protesters out of their area, content to cut supplies and weaken their morale. From what we hear, the government this morning announced that protesters have until 3pm Monday to clear out of the area. They are offering to provide transportation home for anyone who is willing to leave the area before then and will not charge them with criminal acts. No word on what happens after 3pm Monday. Presumably after that point the military will begin to actively break up the protest. We’re staying out of the way and have stocked up on food, water, and other supplies in case we have to stay home for several days. Nonetheless, I don’t think any of you need to worry. We just had visitors in town who left this morning to continue their journey. They were able to see the sights and we just worked around the protest area. We had friends over this weekend for dinner. They were able to come and go without incident. On the whole, life is continuing. I hold out hope that a peaceful settlement is reached and all sides agree to step back from the brink. In the meantime, though, it is good to understand what is going on from a beyond the headlines perspective. That’s my perspective on things. I hope it helps you place the news you are reading in context. This entry was posted in Uncategorized and tagged Bangkok, Krungthep, politics, Protests, Red Shirts, Thailand, UDD by christao408. Bookmark the permalink. Thanks for the updates and the reality. So glad to hear that y’all are OK! Thank you for this perspective! The media is portraying Bangkok as a mini-war zone! Despite what you say, that still seems a bit close for comfort! D:I haven’t been following this closely enough to know the political details, but I hope you’ll continue to be safe in the weeks and months ahead! Its weird. The media is presenting it as a mini-war zone, but they refuse to fully explain the situation. Ive yet to really hear WHY the Red Shirts are fighting so hard and why the military is working so hard to smash up the protesting. Would a quick explanation be possible? With all due respect, Chris (since I love your blog and read it often)…if a war has broken out in a 5 block radius of a city, there’s still a war happening. And that’s basically what’s going on right now. Sure, the media will always over-hype things, but as for the NYT reporter…where else is he supposed to report from? What’s happening is far from innocuous and things certainly are not getting better. There’s a palpable tension throughout the country, so it’s not like people are partying it up outside the firing zones and are oblivious to the war happening within Bangkok.There’s a deep divide in Thailand and this is, unfortunately, all of that resentment finally coming to a boil.I’m glad you guys are outside the firing zones, but I think it’s important to not lessen what is actually happening in Bangkok right now. @somchai_P – Khun Somchai, thanks for the respectful feedback. I feel you may have misunderstood what I am trying to convey in this entry. The point I want to make is that while there may well be a war going on, it is going on in a 5-block radius, not in every corner of the city.I understand that the reporter will of course go to the scene of the event; that is, after all, where the news is. 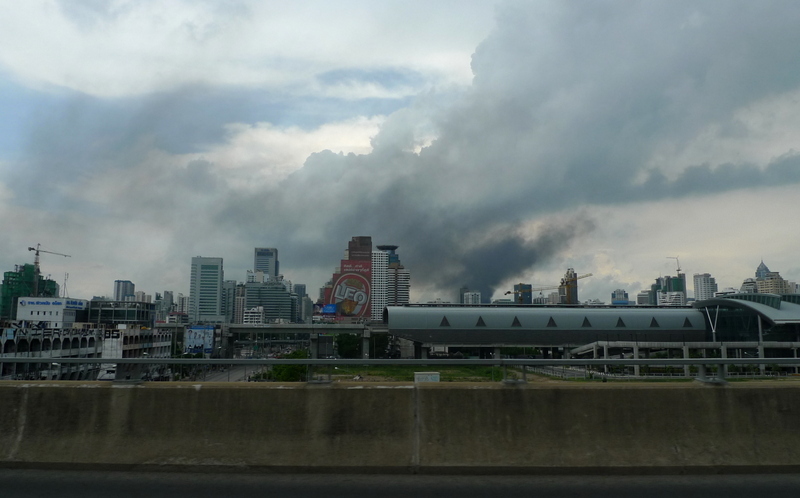 My intent is not to lessen what is happening, but to help friends and family overseas understand that while the situation is serious, the entire city of Bangkok is not up in flames.Please remember that I do not write this blog as a news blog. It is written so my friends and family know what is happening in my life. I don’t pretend to be filtering the events of Thailand or the world through some lens of absolute neutrality. My purpose in writing is to explain how I am experiencing the world and how it is affecting me.Best regards. Thanks for this update, Chris — stay safe! @Ana_R_Kissed – Thanks for your comment. Here are links to two articles that I think do a pretty fair job of summarizing what’s going on here. The first is from The Economist and the second from the New Straits Times. @Senlin – Were this violence spreading, I would be concerned. If it were random events throughout the city, I would be concerned. Were it targeted towards foreigners, I would be concerned. In this case, none of the above are happening. I wish for a peaceful settlement, soon. But I’m not worried. @Dezinerdreams – War zone may be accurate, but the emphasis really need to be on “mini”. @And_I_love – @Toro69 – @worstenemy – Thanks for your concern. I heard you had traded your car for an armored Humvee. I understand that Tawn does have a bullet proof vest(s) that coordinates reasonably well with his attire. All joking aside, it’s always good to know the two of you are safe and sound. Thank you for putting things in perspective, Chris. I’ve been trying to keep updated on what’s happening in SE Asia and the news coming out of Thailand didn’t seem great. I was waiting to read about your perspective on things after hearing about that one man who got shot in the head while giving an interview. Very informative post. Thanks Chris. While I was sure you and Tawn were doing well and were not anywhere near harm’s way, I nevertheless always thought of you too and said a prayer for your safety. Nice to know that you and Tawn are ok. Never the less, after hearing on the news that over 30 people were killed over the weekend, we are still worried. Like you said, we hope there is a peaceful outcome. Good to hear you are ok! Quick question about the picture of a motorcycle taxi driver facing off against a line of army troops. Is the flyover in the background going over Sathorn Road known as the “Thai-Belgium Friendship Bridge”? @Mimi – Correct. Would you like to choose “Bangkok Landmarks” for 400? =D@slmret – @theramblingman – @stevew918 – @ZSA_MD – @bejewel07 – Thanks for your concern, everyone! @ElusiveWords – It is a Burberry bulletproof vest, I think. @Roadlesstaken – The one who got shot in the head during the NY Times interview (done by Fuller) was a rogue general who was openly defying orders and helping the red shirts defend themselves. While I don’t support assassinations, in any other country he would have faced a court martial and possible execution. Wow, reminds me of my days living in Manila! I was there during the coup that toppled Marcos and People Power. Its strange how although all that “war” was going on outside the area of where we lived, although cautious, life went on as normal. We were so used to it. Other than hearing some friends having to move out of their houses to keep safe or others finding bullet shells in their walls, no one was freaked out. But if I were to move back and something like that happened again, I think I would be in a state of panic. Oh, but I do remember loving not having to go to school for many days!Glad you’re both some distance away from the violence. And glad to hear the government has at least contained things. Heard about it all on NPR but they didn’t make it sound like the whole city – just the same clump of protestors… Still I’m relieved you are safe. Just think if you do have to stay in, you could try making the cheese again! Thanks for the local perspective! We in America don’t get much excitement. We need to live vicariously through another country’s revolution to get our jollies. ..Glad you guys are all right. Thanks for the info and pics. @Redlegsix – I think they were saying “live fire zone” so protesters were clear in understanding that throwing Molotov cocktails, while great fun, could also get you shot. @CareyGLY – You’re welcome Carey. @murisopsis – Ah, I love NPR. So much more balanced. Yeah, I really should give another shot at the cheese. Or maybe another batch of macarons! Yellow ones and red ones and then I can pretend they are protesters! @kenpcho – Never, ever believe what they tell ya. @angelwingfive – Looking at some of those tea parties, I worry that they could get ideas from Thailand’s red shirts! Yikes! =D@Texana – You’re welcome. Thanks for reading. It is often best to hear it from the source. Let’s hope it ends peacefully very soon. Even if you say not to worry about you and Tawn, I still do. Even if you guys are not directly affected by what is going on, it is still disconcerting to me that this would be going on anywhere close to you. I’m sending good thoughts to Thailand! I’m glad you are okay! no more buffalo cheese making eh? @christao408 – Dang how’d they get armed?! @yang1815 – Three primary ways: First, many of them are former military. Second, there are many divisions within the military and the police (they’ve arrested active duty members with caches of arms). Third, when the protesters have seized military vehicles and soldiers over the past two months, they have confiscated their weapons. @christao408 – Gotcha. It’s not like the black market/illegal import or something then. @yang1815 – Well, there very well may be some black market activity, too. But I don’t think that’s the bulk of it. Glad to hear you and Tawn are safe and sound at home. Thanks for the update!